Everything to tickle your fancy! Cheese is better with……..SO many good things. Below are the New York State gourmet food vendors that will be offering their wares at the Festival this year. We also have ready-to-eat foods for lunch, or a snack! See our FESTIVAL CUISINE list. Premium hand-crafted butters, including: salted and unsalted, cinnamon-sugar, maple-brown-sugar, honey sriracha, garlic & herb. We also offer farmer cheese, and quarts of buttermilk. We partner with family-owned farms. We are committed to responsibly producing dairy products with all-natural ingredients and no preservatives; we use high-quality milk sourced directly from local family farms. Our products are always free of antibiotics and artificial hormones, far exceeding Federal milk quality standards. We hand-make delicious jams and jellies (peach, jalapeño, blackberry, raspberry, strawberry, elderberry and more), fresh and pickled garlic, sauerkraut (five kinds! ), maple syrup, and more. Handmade, small-batch, all-natural aged artisanal vinegars. Made with Upstate New York apples, infused with locally grown berries and herbs as well as raw unfiltered honey. Wonderful for culinary purposes and many health benefits as well. Flavors include plain unfiltered apple, “fire cider” (includes ginger, horseradish, jalapeño, and more), black currant, honey, raspberry. 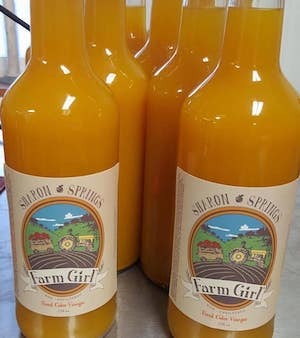 NEW FOR 2019: Infused ginger-and-honey apple cider vinegar. We craft and package traditional and modern orchard-fruit recipes for today’s tastes. We offer All-Fruit Mincemeat, Applesauce with Maple, Orange Sriracha and Lemon Turmeric Salad Dressings. Created by a former pastry chef and history teacher in 2016, Farmer Street Pantry reflects her fascination with the history of mincemeat production in Central New York as well as the excitement of the growing artisan-food movement across the state. Also: homemade pumpkin roll with cream-cheese filling. Gourmet charcuterie/salumni, including country pâté, veal pastrami, veal meatballs, sausage, and more. We offer true farmstead quality meats made on-farm in our certified commercial kitchen from pastured, heritage-breed pork and mother's-milk fed veal. Everything vacuum-sealed and ready to take home. Very special, superb-quality baked goods. 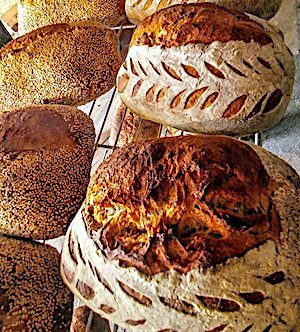 Our specialty is naturally fermented sourdough breads and pastries, using a large amount of New York State-sourced flours—baked in a woodfired oven. We bake over 30 varieties of sourdough breads, along with croissants, danishes, pretzels, babkas, and more. So delicious, and great with all sorts of cheeses. Sample our delicious sweet-cream meadow butter from our grass-fed cows, salted and unsalted. We will be selling it in half-pints and pints. We’ll also be offering créme fraiche from our grass-grazed cows—absolutely delicious. NEW FOR 2019: cultured butter (European style with nutty, tangy flavor; made from local organic family farms; 84% butterfat) and superb Baker’s Butter (made from local organic family farms; 85% butterfat). Don’t let the name mislead you. “Dawg” can be considered a term of endearment or has the meaning of friend in certain parts of the country. That’s why it’s sizzlin’ sweet and not hot! We make the best sweet specialty mustard, and we are not shy about it. It is high-quality, food-friendly, and ready for consumption. NEW FOR 2019: Sweet Hot Mustard! Also: sausage seasoning mixes (breakfast and Italian hot). Delicious nuts roasted on-site. Cinnamon-roasted pecans, almonds, cashews, and peanuts. Savor Myrtle’s lemon-blueberry cookies, strawberry-covered scones, and more. NEW FOR 2019: taco dip! Unique, delicious, addictive! We make an Italian “salsa” with a select combination of imported Italian cheeses, chopped to perfection and blended with the finest fresh ingredients. Our salsa can be used a a spread, relish, dip appetizer, or a great addition to any recipe (pasta, pizza, use your imagination!). Gluten-free. We are gourmet nut butter artisans. We handcraft over 40 butters in small batches the old-fashioned way. In addition to our delicious signature smooth and crunchy peanut butters, we offer a host of fun and tasty variations such as “I Want Smore” (dark chocolate, peanut butter, layers of marshmallow and graham cracker), “Open Sesame” (Thai-inspired peanut butter), and “I’m a Sap for Peanuts” (New York State maple peanut butter). Also, we offer Almond Butter and flavors, Coconut Butter and flavors, Healthy Blends, and other nut/seed butters. “The best pickles in the world!” “Epic pickles!” Featuring these award-winning varieties: fresh Kosher dills, half sours, full sours, dill spears, dill chips, hot & spicy dills, and other pickled items. We were voted top three best pickles in New York State. Also: County Pride Cheese Spreads. We were founded by a granddaughter of garlic farmers, and aim to create garlic and onion powders the real way—from fresh garlic and onions, without fillers or additives. Our spices are all freshly milled, organic, and pure. We also make pickled garlic, black garlic, and a variety of unusual and classic spice blends. Our booth has won Best in Show at the Canandaigua Christkindl Market 2018 and the Mohawk Valley Garlic & Herb Festival in 2017. Wholesome – Nutritious – Natural – Artisan – Elegant. A family-run business, we take great pride in creating our recipes and selecting the purest ingredients to bring you a taste that is both unique and satisfying. 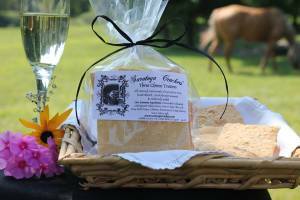 Our crackers are perfect as an everyday snack or for the elegant party. We have a wide variety of options: cheesy, spicy, sweet, savory, wheat-free, vegan, etc. Find your flavors! Saratoga Crackers are proudly featured in many “Taste NY” locations. We hand-make eight flavors of thick-cut rolled oats-based granola using entirely organic ingredients. We also offer granola-chip cookies, and mini-muffins made with our granola. Clausen Farm Blend has baked apple chips, Zante currants, toffee, barley flakes, and walnut pieces. Dawn’s Delight has cranberries, dark-chocolate morsels, sliced almonds, and toasted coconut flakes. Edgefield Blend has cranberries and maple-toasted coconut flakes. Grapevine Farms Blend has bing cherries, white chocolate pieces, unsalted cashews, and toasted coconut flakes. HarvestFest has baked apple chips, maple-toasted coconut flakes, walnut pieces, and harvest spices. Pure & Simple has Hunza golden raisins, sliced almonds, and toasted coconut flakes. Klinkhart Hall Blend has blueberries, white chocolate pieces, cranberries, pecan halves, sliced almonds, and toasted coconut flakes. NEW FOR 2019: Rose’s Request contains no nuts and no seeds; features wild blueberries, Bing cherries, cranberries, and toasted coconut flakes. Everything maple! 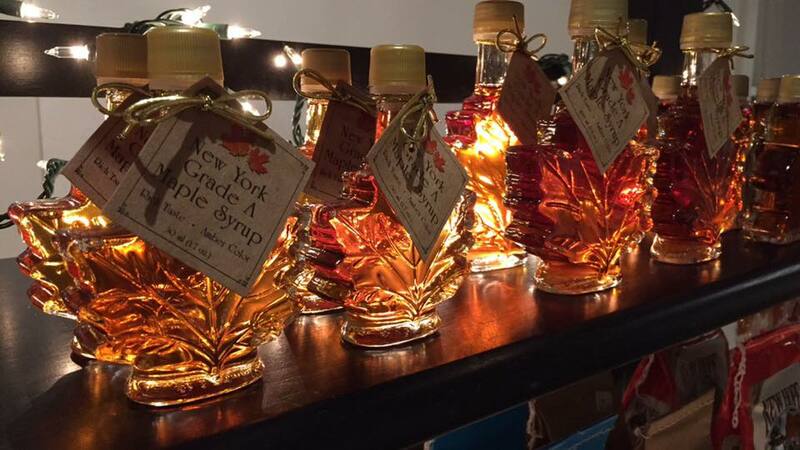 We offer our own pure NYS maple syrup (regular and bourbon-barrel aged) along with many maple-related products: maple cream, maple butter, maple candy, maple sugar, maple seasonings. Also maple mustard, BBQ sauce, popcorn, coated nuts, tea. Also maple baked goods for humans and dogs. Everything honey! Treatment-free raw honey, lip balm, beard balm, beeswax candles, handmade soaps, shampoo bars, deodorants, and more. 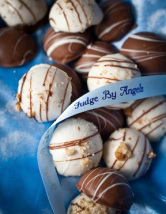 Our products bring the bounty of the season to your table! Our preserves are made in small batches of fresh ingredients and sugar. No pectin. No additives. No preservatives. Whenever possible, we grow, pick, or purchase locally the ingredients whose flavors sing out when a jar is opened. Delicious marmalades, jams, jellies, mustard, herb salts, and more. Creative, small-batch, hand-finished sea salt, curated and crafted by a father-daughter team. We’ll be offering infused sea salts, cheese and bread boards, salt slabs, and cookbooks. NEW FOR THE 2019 FESTIVAL: smokey-bourbon infused sea salt, great on cheese! We create one-of-a-kind serving trays, charcuterie boards, and cutting boards. Each item is unique and crafted with wood sourced from local mills in Central New York. All items are finished with a food-grade mineral-oil-and-beeswax blend. Our woodworker, Andy Jakubowski, was featured in the Everson Museum’s November 2018 exhibit “On My Own Time.” His live-edge table was chosen from hundreds of submissions fro 13 different organizations and businesses in Central New York. Local honeys, including Extra Ray, Creamed, Wildflower, and Buckwheat—available in multiple sizes. We also have maple syrup, beeswax candles, lip balm, skin cream, and bee pollen. In 1917, Mr. Harold Webb of Roseboom, NY, began catching swarms of honey bees and collecting honey on his family’s farm. Today Harold’s great-granddaughter and her family keep the family tradition alive. 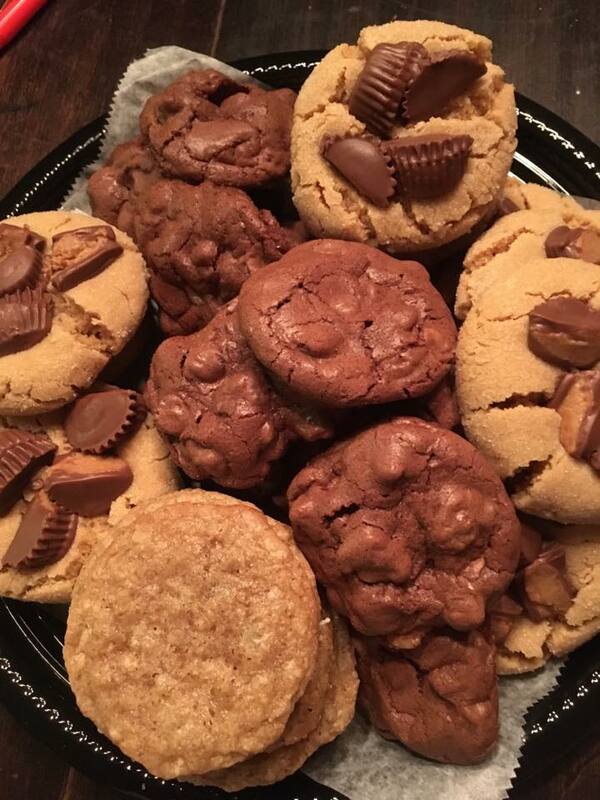 “Cheat free!” Our bakery offers scrumptious treats in regular and vegan options: cookies (chocolate chip and peanut butter, oatmeal-raisin, molasses-ginger), baklava, brownies, lento bars, beer bread..and cheddar-cheese crackers.